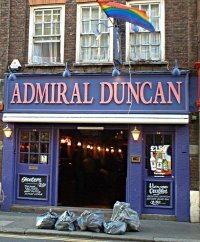 Admiral Duncan is a popular gay bar in Soho, famed for a lively, upbeat atmosphere and mixed crowd of party seekers. The music policy is mainly 80s and 90s, with a few modern hits for good measure. The customers range from mid 20's upto 60+ year old. We offer a 'non-camp', 'non-scene' venue aimed specifically at the mature gay man, predominantly targeting the ages of 35-55, although our customer base ranges from 18-90. We offer a friendly, traditional pub atmosphere in the Upstairs Bar, with a bar/night club in the Lower Bar offering a comfortable sit down bar mid-week and a Dance floor with DJs at the weekend. Opening times:- Monday to Thurs - Noon - 2am; Sat Noon - 3am; Sun Noon - 1am. Hugely popular gay bar in Soho Square offering drinks, cocktails, soft drinks, dj's, drag queen shows, celebrities. Packed to the rafters with handsome guys. Dinky, friendly bar in the heart of Soho, with some of the capital's best DJs and VJs; one of London's landmarks on the gay scene. 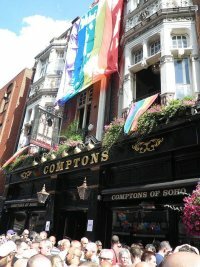 A london gay institution, this is one of londons top gay bars and is always packed, seven days a week. 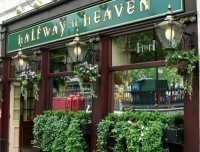 Cheap drink promotions and a friendly crowd make this one of the most popular places on the scene in London. G-A-Y bar is on 3 floors pakced full of a young 18 - 30 crowd. Video jukeboxs provide extra entertainment. Soho's premier cocktail lounge / late night venue. "Gay friendly"
Gay bar, between Charing Cross Station and Trafalgar Square, orientated towards the 9–5 male worker. Entertainment is on 7 nights a week, with cabaret and karaoke. Each night has a different crowd-puller. We are one of the cheapest bars close to Soho.